Mumbai, March 20: The Mumbai Police on Wednesday urged Mumbaikars to cut the noise this Holi. Holi 2019 will be celebrated on March 21, Thursday, across India. Mumbai Police, in a tweet today, asked people to say no to noise pollution during the festival of colours. "Don’t let treble become trouble this Holi! Colours, not noise, make the right choice #SayNoToNoisePollution," Mumbai Police tweeted. Holi 2019: How NOT to Celebrate Holi This Year – A Guide. 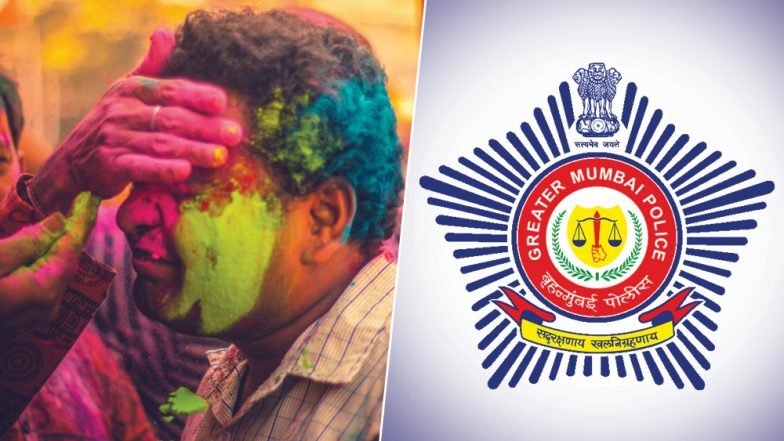 The Mumbai Police tweet comes in the wake of several events being organised in the city on the occasion of Holi. Several Holi parties witness loud sounds. The police have urged people to celebrate the festival of colours sans the noise. Holi 2019: The Colour of Festivals is Not For Stray Dogs and Pets! Keep Animals Away From The Festival of Colours. Meanwhile, another thing to be careful about around Holi is not to throw colours on stray and pet animals. The Holi colours have a toxic effect on the skin of animals. The colours tend to stay on their fur for a prolonged time, thereby, leading to several diseases affecting their health. Holi will be celebrated across the country tomorrow. On the evening of March 20, people will observe Holika Dahan by lighting a bonfire and will then play with colours the next day on March 21.